You know that ever-so-frequent moment when your mind starts drifts to a tropical island filled with swaying palm trees, soaring cliffs and vine-covered mountains? That place where you conjure up an afternoon of gratuitous lounging, filled with copious amounts of wine and food while listening to soft island tunes in the background? Fortunate for you, the only difference between a daydream and reality is a plane ticket! Madeira is by far one of the most dramatic places I’ve ever visited. If you’re looking for a straight line…anywhere, forget it. There are two directions: curved and vertical. To survive, you embrace your inner island jedi and accept that your head will be on a perpetual roller coaster, swirling among canopy vines, whitewashed cottages, and enough island charm to put Gilligan to shame. The only issue is, with so much explore, what’s worth your time? Let’s see if we can’t sort out some top highlights! If your mind immediately conjures up 2,000 °F viscous rock baths that will not only exfoliate your skin, but much of your existence, think again. These are naturally formed salt water pools from ancient volcanic activity; pools that are perfectly suited for children who still want the natural feel of the sea but without fierce undertows, crashing waves and sharp pebbled beaches. Located in the tiny, northwest village of Porto Moniz, these 3800 square meter beds are surrounded by lush greenery, heaps of seafood restaurants and enough hiking opportunities to keep you in shape for a lifetime! I’ll be honest, there’s nothing quite as exhilarating to a city-dweller than the mere expectation of spotting a gray 50 ft long baleen whale. Much like standing next to a 15,000lb elephant, you can’t help but feel dwarfed, as if your existence on the planet is relatively meaningless. 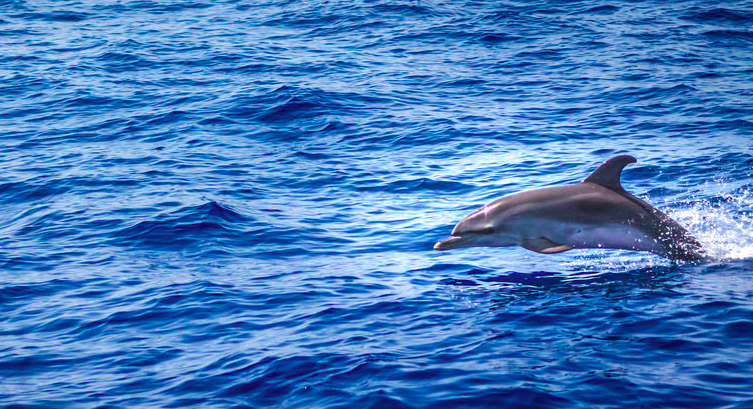 Fortunately, that deep, philosophical moment is quickly counterbalanced by the appearance of 30 mischievous bottle-nosed dolphins who want nothing more than your undivided attention. Jumping on a whale and dolphin tour, especially at sunset, is absolutely worthwhile, especially if you’re keen to swim along pristine coves ripe for snorkeling. Located between two river-valleys that flow into the Atlantic Ocean, Cabo Girão boasts of some of the highest cliffs in Europe, standing at approximately 589 meters (1,932 ft) above sea level. The view is absolutely breathtaking on a clear day, giving you a bird’s eye view of Cabo de Lobos, not to mention, much of the Atlantic! If you have a strong (and I do mean strong!) constitution, swing by the skywalk. Similar to the glass-bottom lookout at the Grand Canyon, the Cabo Girão Skywalk offers a death-defying view of the base that will promise vertigo and a serious contemplation of your living will. That said, this is a tourist haven. So if your plan is to channel Braveheart, be sure come early when the crowds are still sleeping. Regardless if you’re a wine aficionado, or not, head to a Madeira Wine Lodge. Not only is it one of the most beat-up beverages on the planet, but it’s also one of the most diverse and delicious wines I’ve had the pleasure of exploring. Many of the lodges, located in the heart of Funchal, not only provide a customize tour and tasting, but contain museums that lay out exactly why Madeira wine is such an exotic beast! And trust me, it is! You’ll be hard-pressed to find a liquid with as much character and resilience, which is also what makes it so damn good! My suggestion: check out either Blandy’s or d’Oliveira, as they’re not only easy to get to by foot but are tourist friendly for those who need a crash course. For those who need something a touch more advanced, feel free to contact us directly to help plan an itinerary to meet your needs. 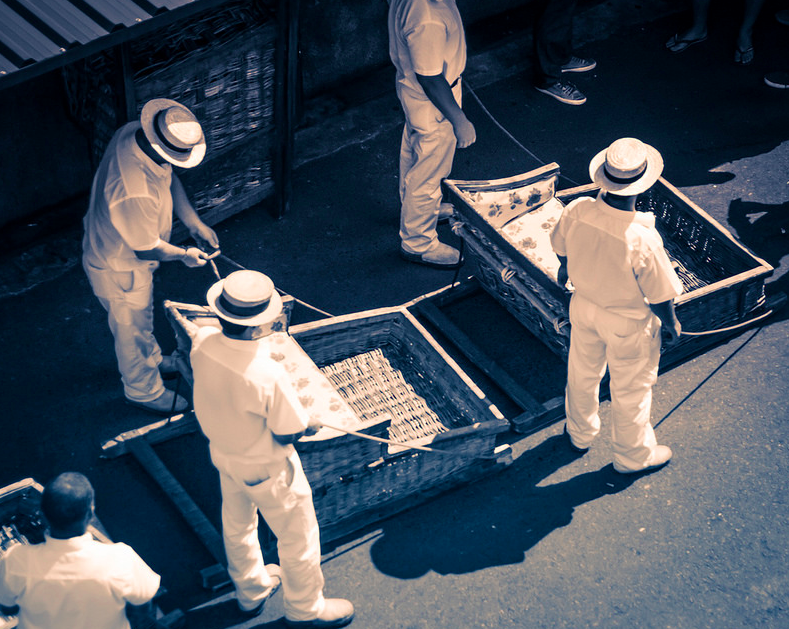 If you’ve done any research whatsoever on Madeira, you’ve heard about the “carro de cesto” (aka toboggan ride) in Monte. Located in the northeast corner of Funchal, Monte extends along the steep mountainous foothills; historically, making it a long and tedious journey for anyone keen on getting to the city inside of an hour. But with a two-seater wicker basket lined with metal runners, and pushed by a dapper pair of drivers called carreiros, traveling came easy! Today, you can enjoy a cable car ride from the Campo Almirante Reis station in Funchal to the Monte, while taking in the panoramic view of the city. From the Monte station, it’s a 10 minute walk. The downhill journey to Funchal is made in about 10 minutes on a total course of 2 km, reaching at times a speed of 48 km/hour – perfectly child safe. For those you pine for a day of pure, unadulterated nature, explore the Levadas. Levada is a Portuguese term deriving from levar – meaning “to carry”, and is roughly translated as “carriageway” or “mini-canal”. These mini-canals are irrigation systems that distribute water from the rainfall heavy and wet regions on the north of Madeira island to the drier sun-drenched regions of the south. They also happen to be some of the most beautiful trails on the island, crisscrossing more than 3,000km! On steamy hot days, the levadas provide a cool respite from the relentless heat, and tend to lead to some of the most exciting vistas in the Madeira Natural Park and the Funchal Ecological Park. If you love exotic flavors, adore vibrant colors and shapes, or simply appreciate a sea of gorgeous humanity, visit the Mercado dos Lavradores. Located on the edge of the old town in Funchal, this charming, quaint, youth-driven market was an absolute joy to visit, not to mention, a masterclass on island flavors! Ever taste a Custard Apple, a Split Leaf Philodendron, an Indian Fig or a Pitanga? No? Me neither until this trip! Nor had I ever delved into the world of passion fruit, where each color expresses a completely different flavor! My suggestion: pick out a healthy variety fruits and veggies you’ve never tried before and head to the botanical garden to enjoy two unique experiences at once. That said, be sure to swing by the bottom floor of the market before you gallivant off into the sunset, because you just might catch one of the fishmongers slicing through a giant tuna with the precision and grace of a surgeon. 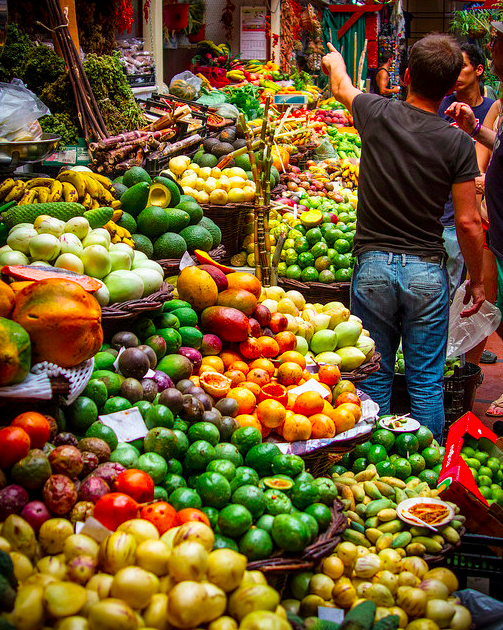 Additionally, don’t hesitate to purchase from street vendors, as their fruits and veggies are equally divine! There’s nothing quite as challenging as having an island’s two signature dishes sound identical to the untrained ear. For the first few days, I found myself in gastronomic wars with my dinner mates, speaking of one dish, the Espetada (grilled meat on a skewer), while they spoke of Espada – black scabbard fish. “Wait, what do you mean that it wasn’t served on a skewer? Isn’t that the entire theme of the dish? !” No, Gabriella, it’s not…when it’s fish! Needless to say, they’re both spectacular when served well. For Espetada, head to Adega da Quinta located high in the mountains of Funchal with a breathtaking view of the sea. Their traditional skewers dangle from metal stands and tease you with their succulent, juicy interior. If you’re keen to try Espada in a savory banana sauce, check out Chalet Vincent. It’s a charming and quaint little restaurant, perfect for a romantic evening. I love cities, but I’m obsessed with the country, especially when adorned with natural parks, waterfalls, wild horses and gigantic cliffs. It puts your life in perspective, allowing you to focus on something other than the state of your laundry or your coworker’s annoying laugh. Simply watching the sun gently rise in the morning with a glass of maracujá borders on ethereal, if not sinful. The North of the island is sparsely populated, offering the perfect setting for hiking, horseback riding, orienteering, or just kicking back and sipping on Poncha. If you need a recommendation for a great hotel, check out Quinta do Furão. This 5-hectare bio-hotel is nestled on top of a cliff in Santana, where they grow their own produce, enjoy stunning star-filled evenings among crashing waves and cater insanely delicious breakfasts. Every island has their signature drink made with rum, and Madeira is no different! At its base, Poncha is made with aguardente de cana (rum), honey and lemon. A fresh fruit juice – such as lemon, passion fruit or tangerine – is added afterward to distinguish the type, in addition to sugar and spices. Granted, this may not be the most refreshing drink when summer temperatures crank up to 100 °F, but cool evening breezes offer plenty of opportunities to enjoy it along the coast. You can either make this bad-boy at home, or you can hightail it to Madeira and enjoy it in its true environment – clearly the latter is preferred! To find a great version, you can either ask a local, or check out Bar Number 2 in the Old Town! 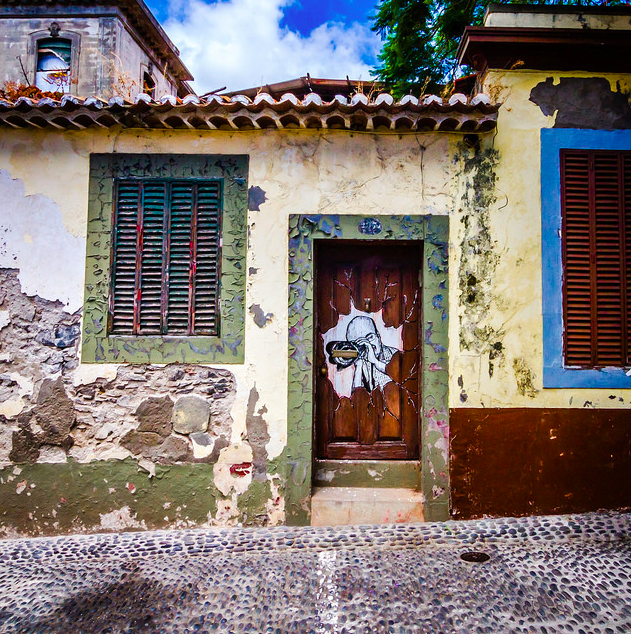 As a whole, Funchal is a fantastic city to explore. It’s unbelievably clean, strangely cozy, entertaining and populated with incredibly warm people; but the Old Town (Zona Velha) has a special feel all to itself. Crammed between the Mercado dos Lavradores and the Fortaleza de Santiago, Zona Velha is an old fishing neighborhood turned hip with familiar restaurants and cafes by day and vibrant music and bars by night. Despite its popularity, it doesn’t feel like tourist trap…yet, but more of a funky, artistic neighborhood adorned with handpainted doors (Open Doors Project), intricately designed cobbled streets and enough charm to sink a battleship. It’s worth a visit, especially if you make your way to up Rua de Santa Maria to Barreirinha. Perched on a cliff, it’s a great place for a bite to eat. If you’re prone to pass out when on a ladder, skip this suggestion. If, however, you envision yourself with wings and a propensity climb on your roof to get a better view of your town, check out both Curral das Freiras (Valley of the Nuns) and Pico do Areeiro. 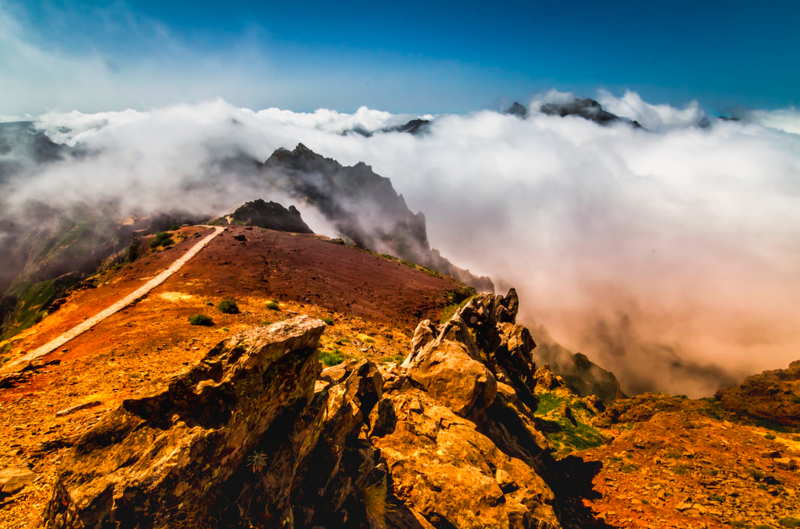 Pico do Areeiro is the 3rd highest peak in Madeira, with 1818 meters altitude, right behind the “Pico Ruivo” with 1862 and Pico das Torres with 1851 meters altitude. If you are not into hiking, this is ideal for you, as it’s the easiest to reach by car. From the top, the view is amazing and you can see other parts of the island, such as the Curral das Freiras, the Ponta de São Lourenço and if weather allows Porto Santo Island. For hikers, check out Curral das Freiras. In the 19th century, the Curral das Freiras was used as a refuge by the nuns of the Santa Clara Convent whenever pirates attacked the island. Today, it’s a small village nestled at the foot of a deep basin, surrounded by the rugged peaks of the surrounding mountains, offering a stunning location for active hikers. Mind you, these are just a handful of suggestions from the zillions we could choose from! If you’re keen for an experience catered just to your interests, let us know! We’d love to design a trip customized just for you!